Crease Proof Sunscreen Eye Makeup with SPF 15. These semi-matte creamy eye colors are highly water resistant and last all day without creasing or fading. The colors blend on fast and easy using either fingertips or Illuminare's special brushes. 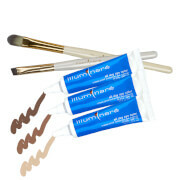 All of Illuminare eye colors can be used as eye liners and brow fillers when used with our eyeliner/brow brush (included in kit). They are safe for contact wearers and sensitive eyes. 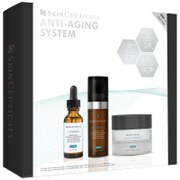 Their Extra Coverage formula is a fabulous base for their eye colors. Each Kit comes boxed to make a nice gift. Cafe Latte: Zinc Oxide-5% & Titanium Dioxide-4.4% Cyclomethicone, Quaternium 18 Hectorite, SD Alcohol 40, Iron Oxide, Decamethyl Cyclopentasiloxane, Dimethicone Copolymer, Triethoxy Caprylylsilane, Zinc Oxide, Dimethicone, Lauryl Methacrylate/Glycol Dimethacrylate Crosspolymer, Titanium Oxide/Trimethoxycaprylylsilane, Phenoxyethanol, Methylparaben, Ethylparaben, Propylparaben, Butylparaben. Cafe Americano: Zinc Oxide-5% & Titanium Dioxide-4.4% Cyclomethicone, Quaternium 18 Hectorite, SD Alcohol 40, Iron Oxide, Decamethyl Cyclopentasiloxane, Dimethicone Copolymer, Triethoxy Caprylylsilane, Zinc Oxide, Dimethicone, Lauryl Methacrylate/Glycol Dimethacrylate Crosspolymer, Titanium Oxide/Trimethoxycaprylylsilane, Phenoxyethanol, Methylparaben, Ethylparaben, Propylparaben, Butylparaben. Espresso: Zinc Oxide-5% & Titanium Dioxide-4.4% Cyclomethicone, Quaternium 18 Hectorite, SD Alcohol 40, Iron Oxide, Decamethyl Cyclopentasiloxane, Dimethicone Copolymer, Triethoxy Caprylylsilane, Zinc Oxide, Dimethicone, Lauryl Methacrylate/Glycol Dimethacrylate Crosspolymer, Titanium Oxide/Trimethoxycaprylylsilane, Phenoxyethanol, Methylparaben, Ethylparaben, Propylparaben, Butylparaben. I now exclusively use illuminare products. This set works great as eye shadow and liner. I also use their black gel liner. It is a little hard to use at first, but after a few days you'll be a pro. It stays on wherever you put it and lasts forever! Great colors, great coverage. Looks natural and doesn't run. This eyshadow is natual looking, and REALLY stays on. I have all the browns and the hilighter. I also layer powder eyeshadows over them when I want a more "unatural color". This company has wonderful base also, and I am so glad it is available here. All good!